You can now download a copy of our Memorial/Honor form. Then just simply fill out the form and send it to the library with your donation! Securely donate online through the Westmoreland Library Network (powered by PayPal). You can also donate to the library through the United Way of Westmoreland County. 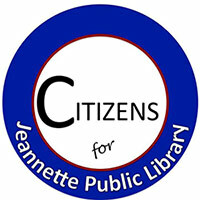 At the bottom of the United Way form, write in “Jeannette Public Library.” Our number is #1156. The number is helpful, but is not necessary. We are not partners with the United Way, but your contributions will still reach us. If you elect to donate through the United Way of Allegheny County, you must identify us as a Contributor Choice Agency and enter the Library Code: #1156 Thank you for thinking of Jeannette Public Library.